Grow the volleyball IQ. Athletes must grow past rote repetition and understand the game of volleyball and how to win. Varied practice formats. Virginia Elite utilizes “Academy” practices, “Team” practices, clinics, and workshops to develop athletes. Academy Practices. In this format, players can be grouped by skill or position to focus on unique development. Earlier in the season, these practices focus on rote skill execution and proficiency. As the season progresses, tactics and “the why” is focused on to implement skills at the right time. Team Practices. In this more traditional format, players work with their immediate teammates to develop the team’s ability to compete and win. Clinics and Workshops. Often held for specialized skill sets (e.g., Setting), these sessions provide extra time for isolated skill development in a small group atmosphere. Performance feedback. We provide both skill-based, tactics-based, and metric-based feedback to develop our athletes. Skill-based. We implement club-wide simple cues to develop skills and reinforce those same cues at all ages. We educate our staff so that any coach can provide technical instruction to any aged athlete. Tactics-based. As players progress, we continually challenge them to undertake increasingly advanced tactical decision-making, or “volleyball IQ”. Metrics-based. 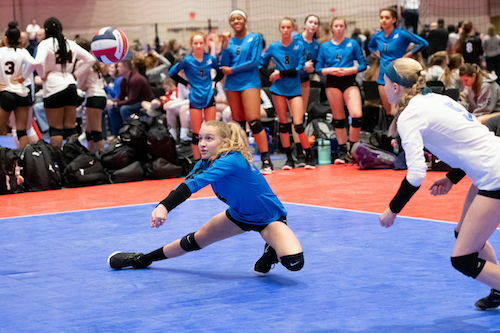 We utilize volleyball stat software for all matches across all ages, and we use multiple tools to provide feedback during practices. Accountability. On and off the court, we hold our athletes accountable. We have found that accountable athletes are more focused, more coachable, and more driven.